It only takes one post-family Christmas living room littered with huge piles of torn wrapping paper, ribbons, boxes, bags, tissue paper, and gift tags to make you realize how wasteful gift wrap can be. Chances are a large portion of that gift wrapping will wind up in the recycling bin or trash can. Luckily there's other more eco-friendly ways to make gifts look pretty under the Christmas tree using supplies you can find in your recycling bin, stuff slated for the garbage, or household items that can double as gift wrap. Here are six ways you can recycle common household items into fantastically green gift wrap. Save bright-colored or interestingly patterned junk mail, office papers, and school papers. Then, cut off the best colorful, graphic pieces to use as holiday wrapping paper. It’s amazing how expensive feeling, heavy, and colorful some junk mail is. After cutting up the junk mail, used office paper, and school papers to use as gift wrap, you might have a few scraps left over. Cut those pieces into small gift cards, punching a hole through the top. This is a great way to reuse the scraps and save them from going into the trash. Another great tip is to fold old business cards in half and punch a hold to create instant gift tags. When a piece of clothing becomes stained or torn, don’t toss it. Instead you can use it as fun fabric gift wrap. Simply cut the old clothing in large squares, wrap gifts, and secure with tape or better yet, cute reusable pins. Do you have stacks and stacks of your kids artwork piling up? Recycle some of the art (that doesn’t get framed or put in the scrapbook) into gift wrap for the grandparents. This is a fun way for grandparents to see the artwork of your children, and children delight in seeing their artwork used as gift wrap. Why not wrap your holiday gifts in reusable shopping bags? These come in a huge assortment of colors and designs and then roll up into a small ball – ready to be pulled out of your car or handbag at a moments notice. If you use one as wrapping, it doubles as an added gift for your recipient. Before anything goes into the trash or recycling bin, give it a second look to see if it could possibly be reused as gift wrap. Who thought the inside of a chip or pretzel bag, would turn into glittery silver paper? All you have to do is cut the bag open, clean the inside with warm soapy water, and wrap away! We do the gifts as wrapping thing...using reusable bags and scarves etc as the wrapping...LOVE the idea of the chip bag!!!!! From Junk Mail to Fun Graphic Wrapping Paper Save bright-colored or interestingly patterned junk mail, office papers, and school papers. Then, cut off the best colorful, graphic pieces to use as holiday wrapping paper. It's amazing how expensive feeling, heavy, and colorful some junk mail is. 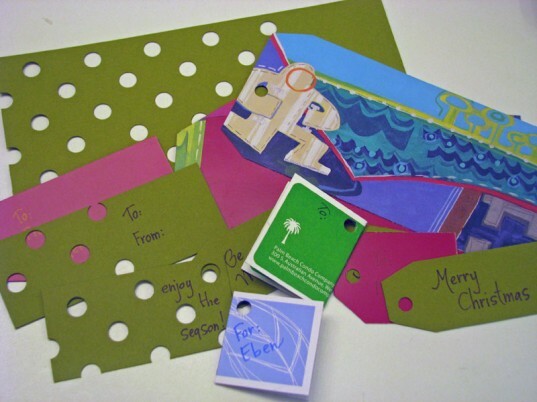 Use Leftover Scraps and Business Cards to Make Gift Tags After cutting up the junk mail, used office paper, and school papers to use as gift wrap, you might have a few scraps left over. Cut those pieces into small gift cards, punching a hole through the top. This is a great way to reuse the scraps and save them from going into the trash. Another great tip is to fold old business cards in half and punch a hold to create instant gift tags. From Old Clothing to New Fabric Gift Wrap When a piece of clothing becomes stained or torn, don't toss it. Instead you can use it as fun fabric gift wrap. Simply cut the old clothing in large squares, wrap gifts, and secure with tape or better yet, cute reusable pins. From Children's Art to Treasured Gift Wrap for Grandparents Do you have stacks and stacks of your kids artwork piling up? Recycle some of the art (that doesn't get framed or put in the scrapbook) into gift wrap for the grandparents. This is a fun way for grandparents to see the artwork of your children, and children delight in seeing their artwork used as gift wrap. From Reusable Bag to Reusable Wrapping Paper and Then a Bag Again Why not wrap your holiday gifts in reusable shopping bags? These come in a huge assortment of colors and designs and then roll up into a small ball - ready to be pulled out of your car or handbag at a moments notice. If you use one as wrapping, it doubles as an added gift for your recipient. From Chip Bag to Glittery Silver Paper Before anything goes into the trash or recycling bin, give it a second look to see if it could possibly be reused as gift wrap. Who thought the inside of a chip or pretzel bag, would turn into glittery silver paper? All you have to do is cut the bag open, clean the inside with warm soapy water, and wrap away!